Dolphins Ballroom. Steinbeck Boardroom. Big Sur. Carmel. The names of these and other meeting rooms at the Monterey Plaza Hotel & Spa only hint at the wealth of visitor attractions nearby. The hotel stands directly along the waterfront in Monterey, California, center stage on Cannery Row and half a mile from the Monterey Bay Aquarium. Today’s guests enjoy a beautifully refreshed lobby that complements the coastal views from nearly every guest room, suite, restaurant, conference room, and ballroom. In addition to 17,000 square feet of indoor meeting space — equipped with the latest in audiovisual and wireless technology — two terraces offer an additional 13,000 square feet for events outdoors against the Pacific Ocean backdrop. For residential-style hospitality, four remodeled suites on the penthouse level combine bird’s-eye bay views with lavish space, coastally inspired furnishings, and amenities ideal for small corporate meetings. Professional planners, caterers, and a technical team coordinate every detail for groups, whether it’s a product presentation, an elaborate banquet, or an offsite team-building activity. Guest rooms received a refresh as well, adding new elegant draperies, bedding, lamps, and furnishings. If guests have time between meetings or activities, there are several onsite luxuries at their disposal. Ascend to the rooftop Vista Blue Spa, dine on contemporary American cuisine at Schooners Coastal Kitchen & Bar, settle in with a cocktail at Helmsman Lounge, or enjoy a specialty drink and fresh pastry at Tidal Coffee. Note: This hotel would be 5 stars if it wasn't under construction during our meeting. We had to walk through the backstage employee sections to reach the meeting space. With that said, this venue was so accommodating. The staff was responsive and friendly. The food presentation had a wow factor AND was a step above normal hotel food quality. The catering staff went above and beyond to ensure everyone was taken care of. The hotel itself was lovely. Not all views are perfect (some have beautiful views of the dumpsters), but the rooms themselves were modern and comfortable. There was nightly turn down service that had the lovely touch of turning on the classical station for a relaxing and classy room. I definitely intend to plan future events at this venue and definitely recommend looking into this site for small to medium sized events. I did not have the opportunity to visit the spa but I spoke to people who have been here before and they said it is a very high quality one. Hotel entrance was being remodeled when I visited; normally I expect it would be a much nicer arrival experience. The Monterey Plaza Hotel & Spa's attention to detail, passion for excellence, and pro-active service is exemplary. We look forward to coming back in 2008! Beautiful site. Excellent accommodations. Pleasant, responsive, and efficient meetings staff. Superior A/V staff. I cannot say enough about this fabulous property. I have been having events there for the past 12 years. It has been with the same customer and they will not go anywhere else. They absolutely fight to get back to this Hotel. It is by far the best property to have an event at as well as a personal vacation. The service is exceptional from check in to departure. You feel that you are the only person on property. The meeting rooms, sleeping accommodations, food and beverage and spa are by far the best that I have experienced. From a personal standpoint, it is the best vacation that I have ever been on. I would strongly recommend this property for any event as well as a personal vacation. It will have a positive impact on anyone for the rest of their life! There is no other place in the country like the Monterey Plaza Hotel & Spa. It is definitely a l0+. We have been hosting one of our annual meetings at the Monterey Plaza Hotel & Spa since 2001. Our attendees enjoy coming back year after year to this beautiful property and many have informed us that if we move the location, they may not participate in the meeting! It's a special hotel in a very special area of the country. The Monterey Plaza Hotel & Spa's attention to detail, passion for excellence, and pro-active service is exemplary. We look forward to coming back in 2008! The Monterey Plaza Hotel & Spa is a favorite of our attendees for the past 18 years. Although one of our programs is too big for the property, we always have overflow rooms at the Monterey Plaza because out attendees love the location and accommodations. Even though our May program is stretching the limits of the property, the staff has done a great job in working with us to accommodate the program without compromising the quality of the experience. We do not want to leave this hotel! Now Part of the Largest Point-Based Program for Independent Hotels in the U.S.
April 11, 2011 – Monterey Plaza Hotel & Spa announced its partnership with Stash Hotel Rewards ®, an innovative hotel rewards program that enables travelers to quickly earn free nights at distinctive, independent hotels without blackouts or inflexible category restrictions. Guests of Monterey Plaza Hotel & Spa can now earn points toward free nights each time they stay at any of the over 120 distinctive hotels in more than 80 cities that participate in Stash. Guests can easily sign up for a free account at the Stash website www.stashrewards.com. Points can be earned immediately and never expire. Redemption is simple and free from rigid reward categories, and black-out dates don’t exist. Additionally, Stash partner hotels provide members with exclusive travel deals. Monterey Plaza Hotel & Spa is a proud recipient of the 2011 Forbes Four-Star Award. Only 160 hotels in the Unites States and Canada have been honored with this distinction, establishing the waterfront resort as one of the finest in the country. 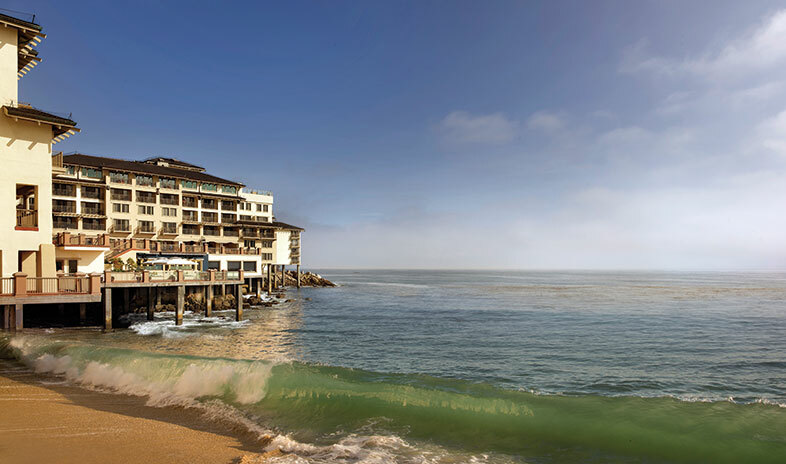 The Hotel is dramatically perched over the Monterey Bay, and offers the perfect vantage point to enjoy the gentle sounds of the surf, fresh scent of sea air and the sight of otters at play. With its Mediterranean ambience and architecture, the Hotel’s relaxing surroundings, coupled with its dedicated staff, ensures that our accommodations, dining and spa services will represent the best that the Monterey Peninsula has to offer for both the leisure and business traveler. Stash Hotel Rewards frees travelers from the uninspired offerings of existing hotel reward programs by making it as easy to earn free nights at an amazing hotel as it is a so-so one. Members earn 5 points per dollar spent on their hotel room, resulting in a free night in a little as 5 typical stays. And Stash points can be redeemed without blackout dates, point expirations or annoying category restrictions found in many chain programs. The distinctive hotels that offer Stash include some of the best spas in Napa, world-class resorts in Florida, and boutique gems in New York, Seattle and Los Angeles. Many Stash partner hotels appear on the “Best Hotels” lists of the leading travel publications and the hotels receive some of the highest recommend ratings on top travel sites. Travelers can easily sign up for a free account at the Stash website www.stashrewards.com. The Monterey Plaza Hotel & Spa ( www.montereyplazahotel.com) is located at 400 Cannery Row, Monterey, California, 93940. For reservations or event bookings, please call (831) 646-1700. The Monterey Plaza Hotel & Spa is a proud member of Woodside Hotels & Resorts Group. MONTEREY , Calif. (March 5, 2008) - The Monterey Plaza Hotel & Spa, the premier luxury hotel in Monterey, has announced the completion of an extensive upgrade of its meeting and event facilities. Dramatically perched over the Monterey Bay, the Monterey Plaza Hotel & Spa is located on historic Cannery Row, only blocks away from the acclaimed Monterey Bay Aquarium. The multi-million-dollar renovation includes upgrades to all 10 conference and banquet rooms -- a total of 17,000 square feet of indoor event space. The main ballroom can accommodate groups of up to 300. Ideal for executive retreats, conferences, and seminars, as well as weddings, banquets, private parties and other social occasions, the hotel's facilities offer stunning views of the beautiful Monterey Bay as well as immediate adjacency to the hotel's more than 13,000 square feet of outdoor plaza and terrace space. Each meeting and banquet space reflects the refined elegance of the Monterey Plaza Hotel & Spa. "We are very pleased to announce the completion of our most recent hotel upgrades," said General Manager John Narigi. "With its grand location overlooking the bay, the Monterey Plaza Hotel & Spa has been the premier luxury hotel in Monterey since 1985. We're extremely proud of maintaining the beauty of the facility, of constantly honing the four-diamond level of service, and of providing our guests with the ongoing modernizations and upgrades that have kept the hotel at the forefront of Monterey Bay's hospitality offerings." The preferred hotel of discerning business and leisure travelers alike, including AT&T Pro Am corporate clients and guests, Monterey Plaza Hotel & Spa provides an extensive array of seamless services: two waterfront restaurants offering incredible views, including the award-winning Duck Club Grill under the direction of Executive Chef James Waller; an exclusive arrangement with Poppy Hills Golf Course as well as preferred access at Spanish Bay and 16 other Monterey Peninsula courses; kayaking, horseback riding and tours of Big Sur; on-premises yoga and state-of-the-art fitness center; and a dedicated concierge service to accommodate virtually any request. In addition to the hotel's indoor meeting and banquet facilities, the Monterey Plaza Hotel & Spa boasts more than 13,000 square feet of outdoor plaza and terrace space, an ideal location for private cocktail parties, banquets, receptions and social events. The outdoor plaza can host groups as large as 600 and offers sweeping views of Monterey Bay and the surrounding coastal headlands. This beautiful terraced plaza is also home to the most photographed spot in all of Monterey - the hotel's iconic Dolphin Fountain. Topping off the hotel's offerings -- literally -- is the magnificent Vista Blue Spa. Located on the hotel's Penthouse Level and sporting 180-degree views of the bay and coastline, the exquisite, 11,000-square-foot facility offers nine treatment rooms and an extensive menu of treatments administered by the hotel's expert technicians. Joining the Vista Blue Spa on the Penthouse Level are the Monterey Plaza Hotel & Spa's three luxury suites: the Presidential, the Cannery Row and the Grand Bay Suite, ranging in size from 1,400 to 2,100 square feet. Appointed with rich cherry wood furnishings, sliding glass doors to exterior balconies with ocean or harbor views, fireplaces, wet bars, refrigerators, oversized bathrooms, state-of-the-art entertainment and telecommunications equipment and exterior sundecks with whirlpools, each suite provides an ideal setting for small corporate group meetings. The Monterey Plaza Hotel & Spa ([url]www.montereyplazahotel.com[/url]) is located at 400 Cannery Row, Monterey, California, 93940. For reservations or event bookings, please call (831) 646-1700. Media contact: Amie Rubenstein, Melissa Howell or Karolina Kielbowicz at Glodow Nead Communications, (415) 394-6500.